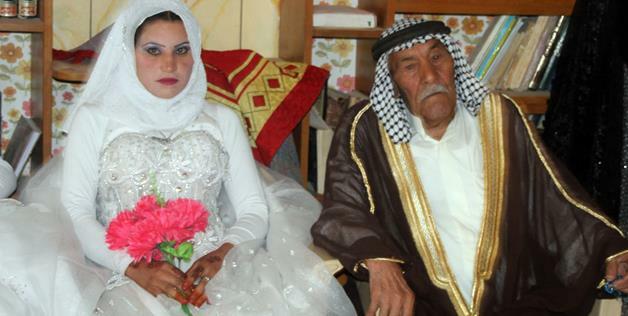 JNN 26 Dec 2013 BAGHDAD: A 92-year-old Iraqi man has married a woman seven decades his junior in al-Ishaki village in Saladin province north of Baghdad. Muslai Mohammed, one of the most prominent figures in his village, decided to get married three years after the death of his first wife, who died aged 58. “I remained alone when my wife died, there was nobody to share anything with. I wanted to have a good time, have some pleasure, but there was nothing. Then God brought her to me and this is for my pleasure. Is that good or bad?,” he said. Muslai’s sons helped their father in choosing the 22-year-old wife. “I asked them (his sons) to get me married and they did not oppose me. They promised to marry me and they went searching for a wife, then God brought her to me,” he said. Muna al-Jabouri, his new wife, voiced satisfaction about the marriage, ignoring the age difference. Farmer Muslai raised 18 children with his first late wife, and lives in a house with his large family of some 325 members. This entry was posted in Iraq News and tagged Baghdad, God, Jabouri, Marriage, Polygamy, Relationships, United States, Utah. Bookmark the permalink. MASHA ALLAH ,MASHA ALLAH ,MASHA ALLAH . QUITE PLEASED AND SMILING . AND YOUNG MEN ARE AFTER THEM . .